We started our morning out attempting to fix the flat tire. The spare tire now on the Jeep was in pretty good condition. The flat tire from yesterday was in very bad condition, as were two of the other tires. Basically, we had one good tire. The dry rot was so bad on the flat tire, we didn’t think it could be repaired. We started calling around and quickly found that almost everyone was closed for the weekend. We tracked down a guy named Roland, who took one look at the tire and confirmed what we thought – No go. 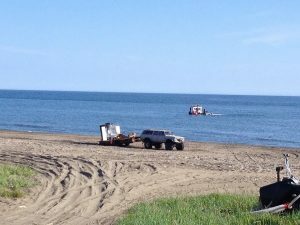 We called the folks back up who owned the Jeep and they were able to track down a tire that would work. 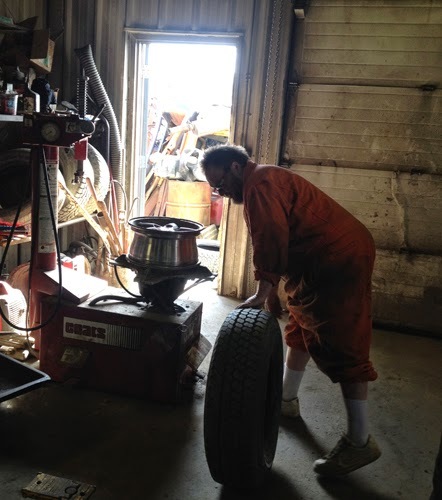 They met us at RJ’s Garage with the tire, and RJ quickly put the tire on the rim. We rolled out of town with three good and two questionable tires, bear mace, a full tank of gas, and left over pizza from the night before. On to explore the 2nd road on this adventure – Council Road. RJ getting us squared away with a tire we can count on. 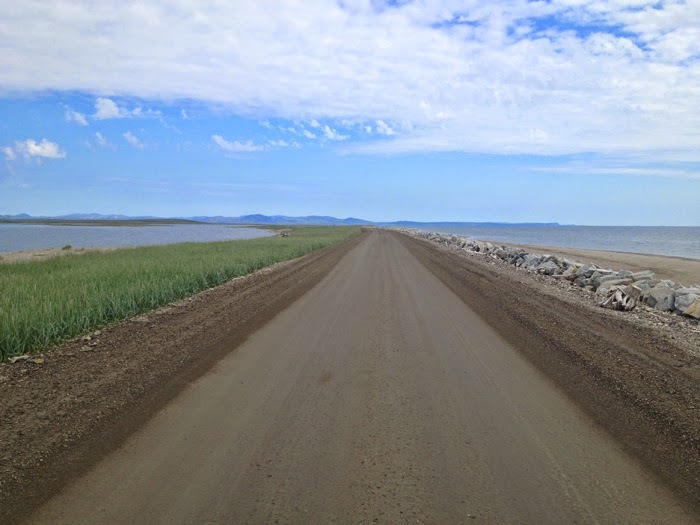 Council Road is a 72-mile gravel road that runs along the beaches of Nome and then turns inland to eventually end at a river with no bridge. 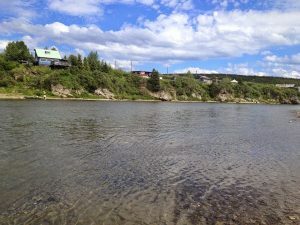 We knew very well that we would not be able to cross the river – in low water, with the help of a local you can navigate your high clearance 4 wheel drive vehicle across. We have a low clearance Jeep and the water is high. Even so, we wanted to drive the road to enjoy the scenery. 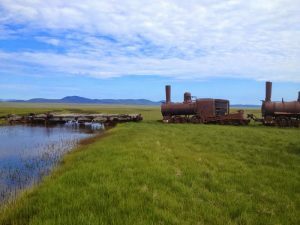 This road allows you to glimpse the gold mining history of the area – including the modern gold seekers still scouring the beaches of Nome for their riches (didn’t they make a reality T.V show about that?). Dredge-like small crafts for sifting the gold on the bottom of the ocean. We had a beautiful sunny day and this road was very different than the Teller Highway yesterday. 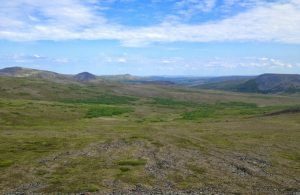 The Teller Highway reminded us of the Dempster Highway – flat rolling tundra for miles. The Council Road often reminded us of the Top of the World Highway near Dawson, YT, Canada. It also seemed to have three distinct environments it covered; coastal, hills larger than rollers but not really mountains, and then an area where trees actually appeared – a lot of northern Alaska is tree-less. 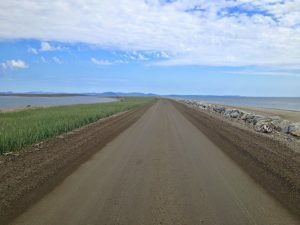 The road started out of Nome and hugged the coast for a while then extended onto gravel bars with water on both sides. The air was muggy and humid and we found we needed to have the windows rolled down most of the day. 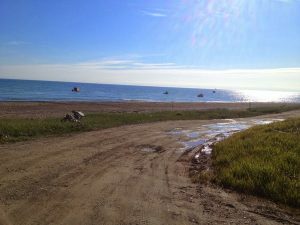 The road travels out on a sand bar like ridge between the Norton Sound and Safety Sound. We passed seasonal fishing camps scattered for miles, as well as gold camps with their tiny rigs floating in the ocean sucking up the gold (hopefully) like vacuum cleaners then spitting out the muck out the back end of their boats. 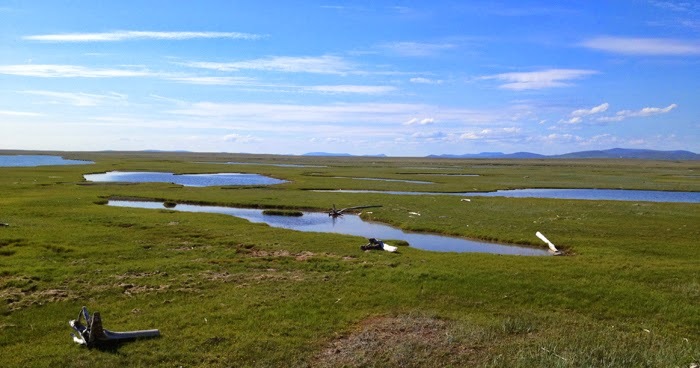 The further we got out from Nome, the sparser the seasonal structures became. Seasonal camp. 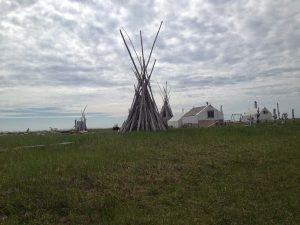 The driftwood “tee-pees” are generally used for fire wood and temp dry storage of wood and miscellaneous items – not generally used for shelter. Me standing in the marsh without adequate footwear. 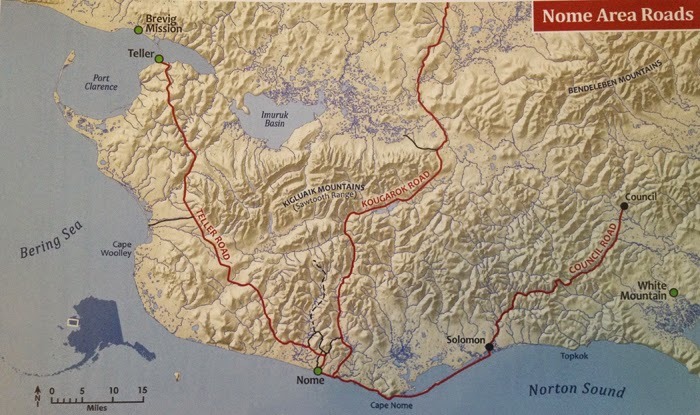 The train was actually ran by the Council City & Solomon River Railroad investors and intended to carry gold from the area – linking a lot of small places to a centralized area. 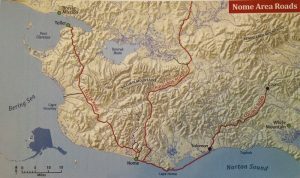 But as the Gold Rush faded in the region, the project was abandoned in 1907. 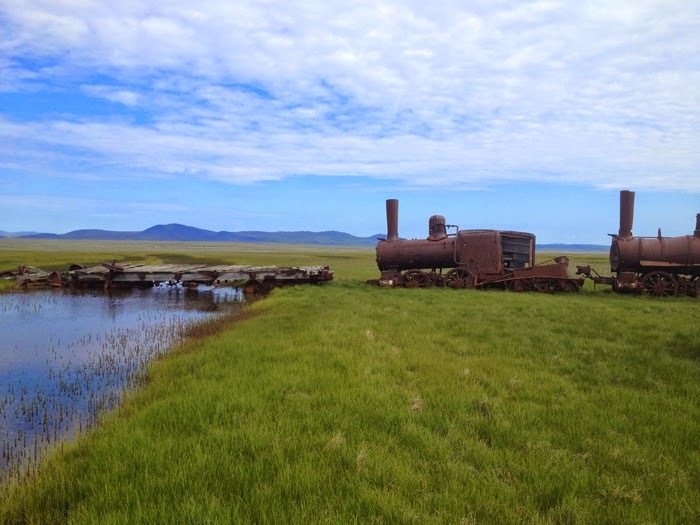 Three locomotives still sit in the tundra, along with all their parts and pieces. I wanted to take pictures here, as well as the old town of Solomon. Driving through this area is interesting because you see so many abandoned things; business, cars, homes, gold mining equipment… everything. It looks like people just walked away at some point. Then, you might see a modern house sitting next to a collapsed building, folks outside having a BBQ for the holiday. 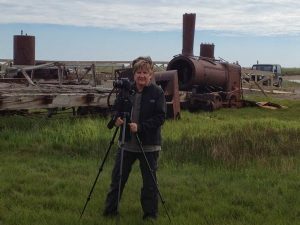 We stopped and explored a few abandoned structures, including a dredge that operated until the 1960s. We didn’t wander too close, not wanting to get hurt. The road climbed up to Skookum Pass with beautiful sweeping vistas in every direction (thus the reminder of Top of the World Highway). 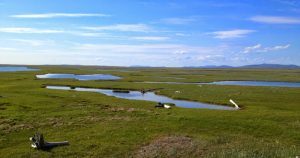 We reached the end of the road at the Niukluk River. 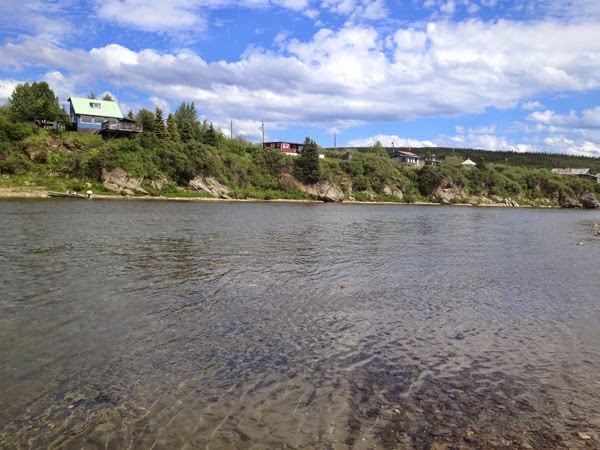 It was too high for our Jeep and we had no desire to cross by 4-wheeler (complements of the locals), so we walked a bit along the river and enjoyed the view before heading back. Near the town of Solomon, we ran into a couple of locals pulled over to the side of the road with tire problems. They had lost the bolt that held their rear brakes together which caused the brakes to seize up and kept the rear wheel tire from spinning. Michael helped them remove the brake from that tire by fastening it to the leaf springs and tying it down. 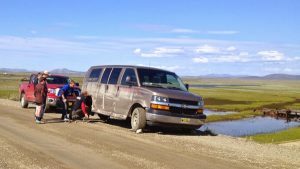 The vehicle now had only three brakes, but the road was flat and at least they could limp back into town to get it repaired. They thanked us and we noted their slow progress the rest of the day. They arrived safely. 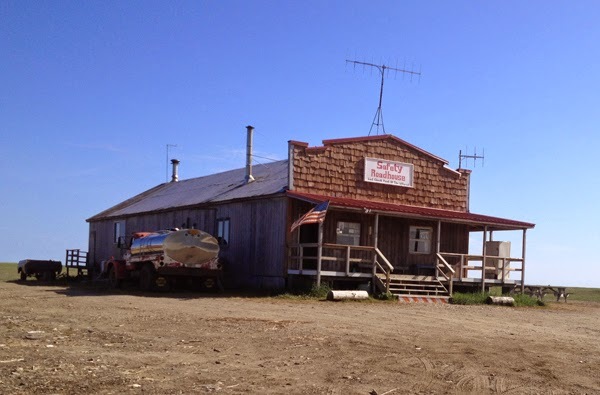 We continued to stop along the way, including visiting the historic Safety Roadhouse, the last stop on the Iditarod. 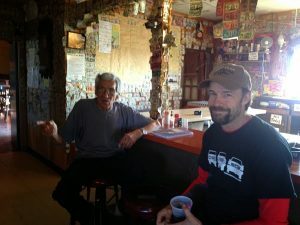 We chatted with the owner, Tom. 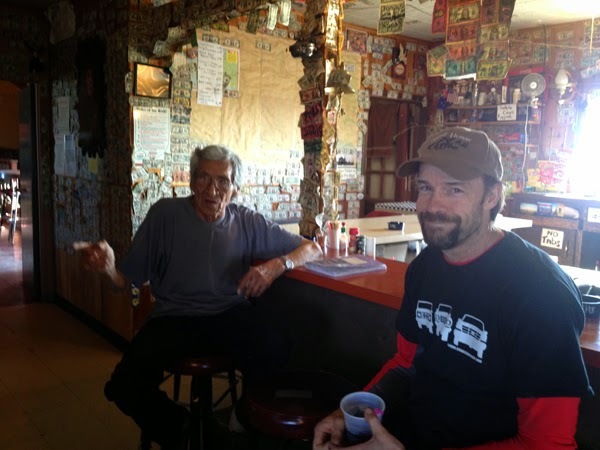 He was almost as historic as the Roadhouse itself. He shared his favorite stories, past and present, of the last great race. He was especially animated about last year’s race where we all thought Aliy Zirkle was the winner and Jeff King’s dogs got confused. I wandered the structure, looking at memorabilia tacked to the walls of many famous race events. What a trip. 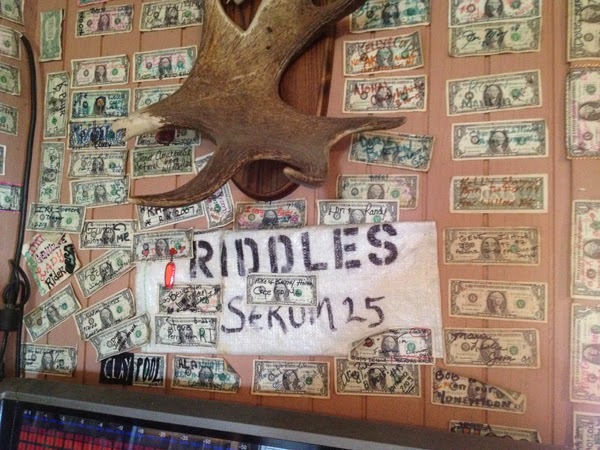 We rolled into the Polaris Bar and Grill for a big cheeseburger and an ice cold beer.